California Raisins will always remind me of… The Claymation Christmas Special. Babies of the ’80s, are you with me? Thanks to the power of recorded from TV-VHS tapes, my sisters and I watched the California Raisins Claymation Christmas special every single year well into our middle school years. Just to double check that I was not the only one who had this powerful connection, my sister confirmed it on the phone a few days ago. I rest my case. Now, onto these muffins! While it might not be the most obvious combination, raisins and chocolate go hand-in-hand in my book. 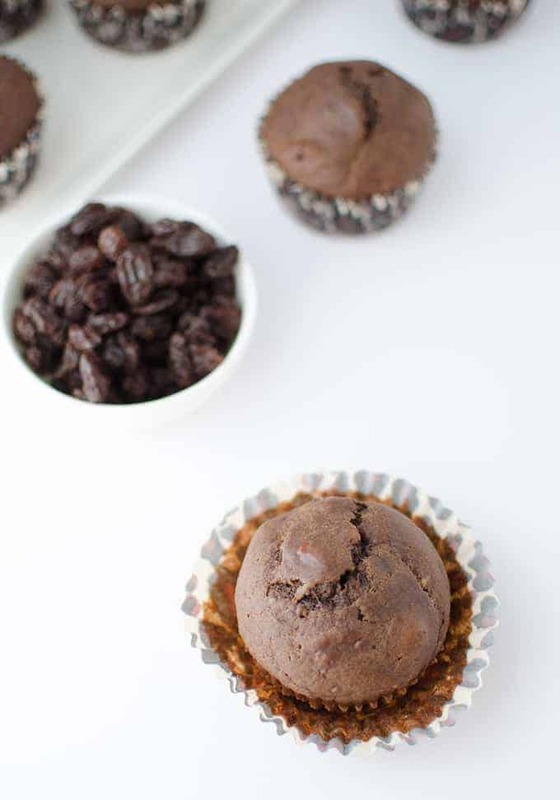 Maybe that’s because raisinets were my absolute favorite movie-theater candy back in the day; but thankfully, I’m moved onto healthier snacks – in the form of these muffins. 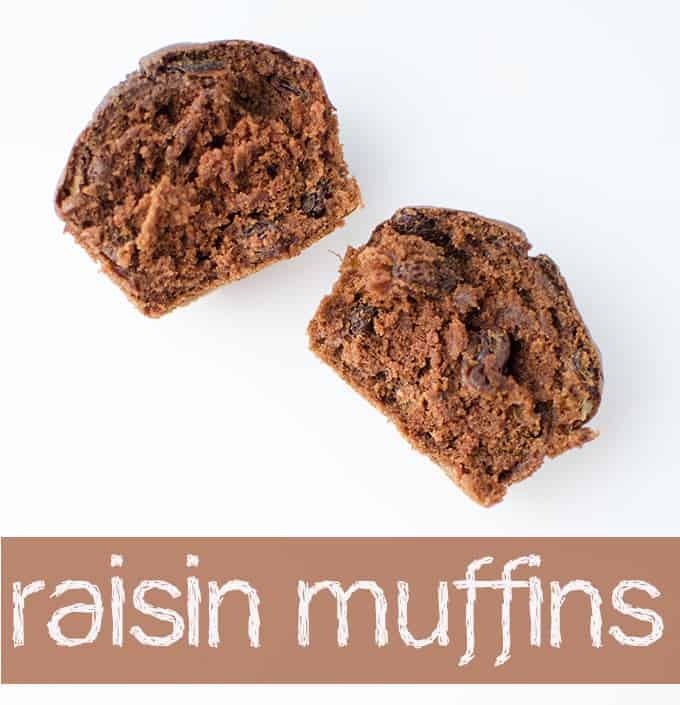 Chewy, chocolatey, and naturally sweetened by mother nature- with raisins of course! You will always find me snacking on raisins (in oatmeal, cookies, or on their own) because they are so convenient! California raisins are a great choice for wholesome, healthy, on the go snacking. Plus, they are the most economical dried fruit. Speaking of snacking, these muffins are the perfect 3PM option. That’s usually around the time I find myself looking for a quick pick-me-up, scouring the office in search of a bit of chocolate. However, lately I’ve been trying to really cut down my added sugar consumption –> no easy feat. I’ve been down this road before as the fall season always feels like the perfect time to cut back on sugar in preparation for the upcoming holidays. Since I still need my sweet fix, I’ve been turning more to dried fruit or these muffins. California Raisins come by their sweetness naturally: zero fat, no cholesterol and best of all- no added sugar (which is sadly not the same with other dried fruits). Plus, each serving offers 6% daily value for iron- a nutrient I am always looking to include a little more of in my diet. In fact, research suggests that eating raisins as an after-school snack may prevent excessive calorie intake later and increase satiety. Which is exactly the kind of snack I can get behind. With a little added chocolate, of course. In a large bowl, combine the dry ingredients: flour, baking soda, salt, baking powder and cocoa powder. In a smaller bowl whisk together the eggs, oil and maple syrup. In a third bowl, mash very well the ripe bananas with a fork or potato masher. Form a well in the middle of the dry ingredients and pour in the wet. Gently stir together. Add in the mashed bananas and raisins and mix until just combined. 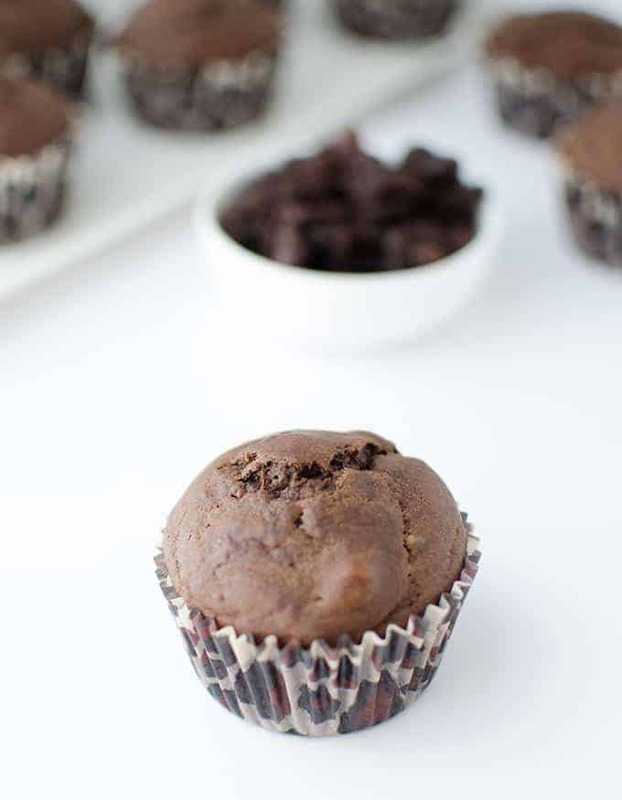 Scoop 1/4 cup batter into muffin tins and bake for 18-20 minutes until toothpick comes out clean. Be careful not to overcook! Remove and let cool on a baking rack. I LOVE RAISINS! These remind me chocolate covered raisins (or, I think they’re called glossettes?). Those were always my go-to movie theatre treat. Chocolate and raisins were meant to be. Also, I had a California Raisins game when I was a kid! Too funny. Those guys need a comeback asap! UM… ME TOO! Chocolate for breakfast is a must! Especially when I am trying to eat healthy! First of all, these look so tasty and are definitely a combo I’ve never tried! And more importantly, yes to The California Raisins claymation cartoon! I watched that thing on repeat for months at a time. Yes! The California Raisins!! I had a set of plastic CR toys. Love it! 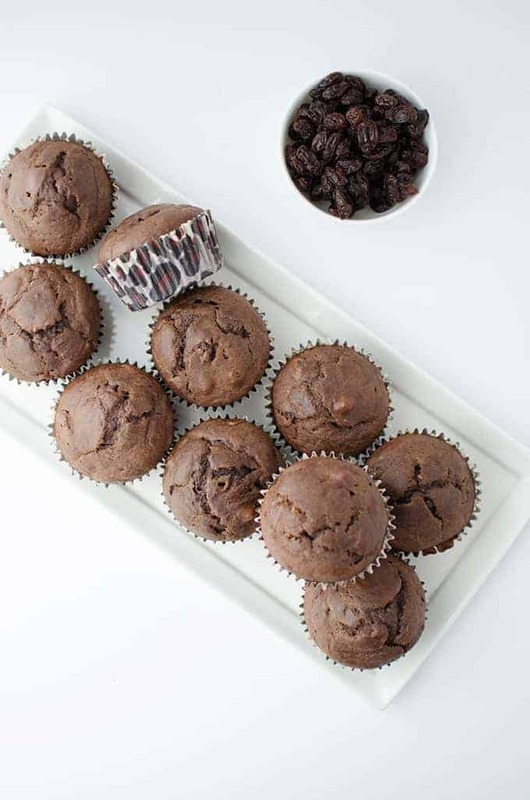 These muffins sound delicious and would definitely help out with the 3 pm slump like you mentioned. I’m trying to rely less on pre-packaged snacks (granola bars, etc). These would be perfect to make at the beginning of the week and eat throughout. Yes! I love that you had plastic CR toys! I am too- I made a batch of these last week for snacking. Also- these warmed muffins with a little bit of peanut butter is incredible! And much more satiating than a granola bar. Those look absolutely incredible! Yum! Alex, these are awesome!!! I’m with you… Raisinets were always my favorite too…. these looks delicious, indeed! and agreed… i’m all about raisinets. definite movie going fav along with junior mints. i’m with regan though, and am afraid i missed the claymation christmas. i will be checking it out though.